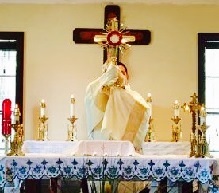 The lifestyle of the diocesan priest is shaped by his service to the local Church. He shares with a Bishop the role of service to the Church in a given geographical area. He ministers by building community, by drawing people together, by challenging them to serve each other, and by urging them to address the social concerns of our times. The diocesan priest ministers by celebrating Eucharist, and by leading the community at prayer, especially in the sacramental moments of birth, reconciliation, marriage, sickness and death. He is the one through whom new members are initiated into the fullness of the life of the church. He is the one who brings comfort to the widow, who visits the sick and who consels the youth with their problems. He is the catalyst in the community who works together with his people to build up the family of God. He is the one who blesses the bonds of marriage for those who are called to begin a new Christian family. He is the one who brings God’s compassion and forgiveness of sins to the people. He is the one who invites the community of believers to live as one Eucharistic people, proclaiming and living out the Word of God. 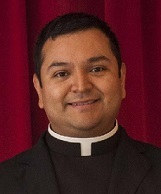 Who can become a Priest in the Diocese of Laredo? Listen for the response to "Who do you want me to be?" "What do you want me to do?" Interested men are encouraged to contact the Office of Vocations or his Pastor to learn more about the particular details for the discernment process for the Diocese of Laredo. 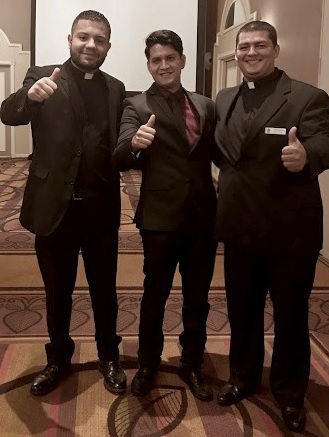 The director will be able to assist you in reviewing the particular Diocesan requirements for seminary preparation and application.The Diocese of Laredo, like most dioceses, has particular guidelines and policies in place to govern and regulate the application process. However, each individual's personal and professional background varies and is taken into account on a one-to-one basis. PhL, M.Div. / M.A. (Th), S.T.B.